Altmetrics can be a valuable tool for showcasing the story of your research in your professional profile. This page provides some inspiration on using altmetrics in a variety of academic contexts. An increasing number of researchers are using altmetrics to help document the varied impacts of their work in their CVs, tenure & promotion dossiers, and grant and job applications. When using altmetrics to document your research’s influence, keep in mind that context is very important for making the numbers you list meaningful. Provide contextual information like percentiles and maps that communicates to your viewer how your paper or other research output has performed relative to others’ papers/outputs. Citations: 4 - listed in the 98th percentile of Biology research published in 2015 on Impactstory. International impact: this paper has been mentioned, bookmarked, or viewed in at least 43 countries, according to Impactstory. Paper covered by more than 100 media outlets worldwide, including The Wall Street Journal and The Guardian. Recommended on 12 research blogs, putting it in the 99th percentile of Biology publications published in 2015. Was described as "a breakthrough study on examples" by prominent genetics and evolution researcher Rosie Redfield. 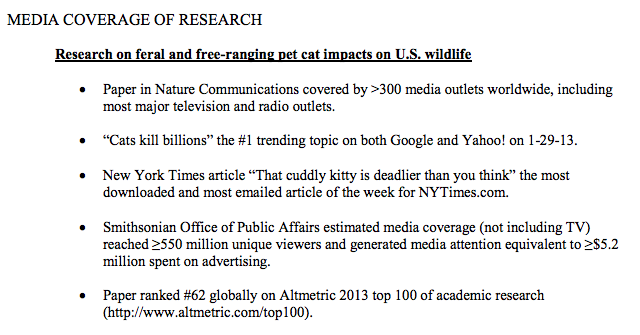 Here are a few examples of how altmetrics information has been included in CVs and Resumes. Note how each writer gives some context for the metrics instead of raw numbers or scores. Some faculty are still unfamiliar with altmetrics, so do your homework before deciding whether or not to include altmetrics in your dossier. Ask around in your department with others who have recently gone up for P&T, and also your department chair, mentor, or anyone else familiar with the P&T process in your department and institution. If you do choose to use altmetrics in your dossier, keep in mind that it's best to be selective with the metrics you plan to include. It's much more effective to include metrics that showcase the types of impact you're looking to document, rather than taking a "kitchen sink" approach (which might overwhelm your reviewers with numbers). For example, if you're looking to document your public outreach & engagement initiatives, you can include how often your work has been mentioned in the press and on Twitter, the pageview statistics for your lab's blog, and the citations your articles have received on Wikipedia. If you want to document the scholarly impacts of your work, you can include the number of citations you've received, how often your work is bookmarked on Mendeley (and by what demographics), reviews of your work on Faculty of 1000, and so on. All of this information can be obtained using PlumX at Pitt. Schedule a consultation with us to help navigate the tools available to you! Promotion & tenure preparation guidelines rarely include instructions on how to use impact metrics. Or, when they do, the guidelines usually only address citation metrics or, worse, recommend using journal impact factors. These instructions often also lack guidance on how to make the metrics meaningful. For example, what does it mean if a tenure candidate says he received 5 citations for a paper published in 2013? Whether that's a good or bad number is often dependent upon the average citations that others in his field receive, and also the year the paper was published (as older papers tend to have more citations, by virtue of just being around longer). There's an obvious need for clear and objective instructions on how to use impact metrics in tenure & promotion dossiers. And there's also a need for guidelines to help dossier reviewers make sense of the numbers. A small but growing number of universities include altmetrics in their tenure & promotion preparation guidelines. Some examples include the University of Colorado Denver Medical School (PDF; page 84) and IUPUI (see: "The Guidelines for Preparing and Reviewing Promotion and Tenure Dossiers"). If you're interested in updating your university promotion & tenure guidelines to better document the use and interpretation of impact metrics, contact your faculty senate (or similar organization) to learn more about how that might work on your campus. You might also get in touch with your Vice Provost for Faculty & Academic Affairs (or similar campus office that oversees the writing of such guidelines). Ahmed’s an Associate Professor in the Department of Biology at American University in Cairo, Egypt. Note the badges that summarize in a glance the use of his work among both the public and other scholars. Ahmed also includes a link to his full profile, so his reviewers can drill down into the attention details of all his works, and also review them for themselves. As of August 2013, JAligner has been cited in more than 150 publications, including journal articles, books, and patents, (http://tinyurl.com/jalignercitations) covering a wide range of topics in biomedical and computational research areas and downloaded almost 20,000 times (Figure 6). It is somehow noteworthy that JAligner has claimed its own Wikipedia entry (http://en.wikipedia.org/wiki/JAligner)! Ahmed received tenure with AUC in 2013. Funding agencies like the NSF are increasingly asking researchers to document the "broader impacts" of their work. Altmetrics are a good way to do that, as they can help you find and explain how your research is being used by other researchers and the public. Holly was awarded a major grant from the Alfred P. Sloan Foundation to develop a bioinformatics data visualization tool called Phinch. When reporting back to Sloan on the success of her project, she included metrics like the Figshare views that related posters and talks received, Github statistics for the Phinch software, and other altmetrics related to the varied outputs that the project created over the last few years. Holly’s hopeful that these metrics, in addition to the traditional metrics she’s reported to Sloan, will make a great case for renewal funding, so they can continue their work on Phinch. Have a question about how to use altmetrics? Send us an e-mail - we'd love to hear from you. The University Library System offers consultation services around altmetrics and bibliometrics to help you develop your profile and tell the story of your research. Check out our Bibliometrics Services page for more information and get in touch with us for a consultation! Much of the material in this section was originally posted on the Altmetrics Libguide from the Duke University Medical Center Library and Archives. Some example text was originally from "What are Altmetrics? ", licensed under a CC-BY license.